Of course on can find an infinite number of interesting goals, depending on personal liking. One can go for records, for 7 summits or 14 8000ers. For us, as regular full-time employees, such things are not realizable and maybe even not worthwile. Also at 7000 m peaks (and, by the way, also at many nice "smaller" mountains) one can have an interesting, challenging vacation with many new impressions. After the somewhat smaller trips of the last years, for 2005 we wanted to tackle a little bigger project again. 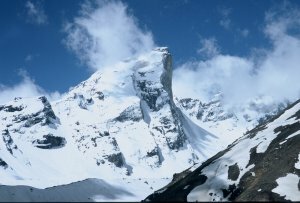 We chose Kamet (7756 m) in Garhwal-Himalaya in India, which is located in the triangle where India, Nepal, and Tibet meet. In May/June 2005 we joined a British expedition which obtained one of the first permits since the area had been closed for foreigners more than 40 years ago. Finding information was therefore the first interesting task in the preparation of the trip. 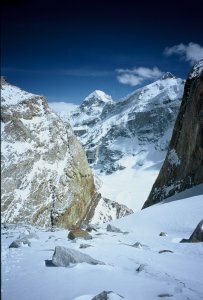 There are hardly any up-to-date pictures of the route, and the only written source is the book describing the first climb in 1931. In those days, Kamet had been the highest mountain ever climbed. You can find some historical aspects about Kamet on a separate page. A long flight from Frankfurt via Paris brings us to Delhi. Departure 7:25, arrival 22:00. An hour later, the other team members from London arrive. Naveen Chandra from the local trekking agency, who will also serve as base camp manager, welcomes us and accompanies us to the hotel. After breackfast we look around in New Delhi, orientation is rather easy with a reasonable city map. Getting rid of the many rickshaw drivers, who always believe to know what we urgently must visit, is more difficult. Around noon it is getting very hot, we have a rest in the hotel. In the afternoon we join our leader for the official expedition briefing at Indian Mountaineering Federation. Since we are the first western expedition in this border region since many decades, the IMF deems it important that all of the (in some cases very restrictive) regulations be followed, for environmental as well for military rules. The hotel offers reasonable comfort. The water supply seems to be not very reliable (or the plumbers? ): There is a beaker to take water from the tap in case the toilet flush doesn't work. At seven in the morning, we* go from New Delhi to Haridwar by express train - by the way, exactly in time. The 300 km trip in the climatized train is comfortable and rather fast. The coach which is waiting for us in Haridwar had left Delhi long before. 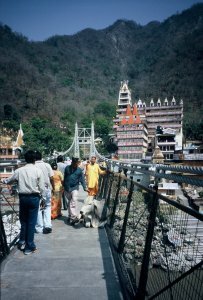 Together with Mr. Pandey, the leader of the trekking agency, we travel to Rishikesh. Unfortunately bathing in the Ganges is forbidden because of river pollution. Here the hills at the edge of the Himalayas, the so-called foothills, are beginning. The mountains are not very high, but the rivers have cut deep gorges and created a labyrinth of valleys. The road sometimes follows the river, then climbs considerable to avoid a gorge, aftwerwards descending the same amount towards the river again. Especially in the frequent landslide areas, the view from the road down the steep slopes is somewhat disconcerting. Over and over again, signs urge to cautious driving: "Keep left", "Drive slower, live longer", "Speed thrills but kills", "Remember God". For 103 kilometers, we read many such texts until we reach Srinagar (Garhwal), which is situated at only 1200 m altitude. At 7 p.m. we arrive there. 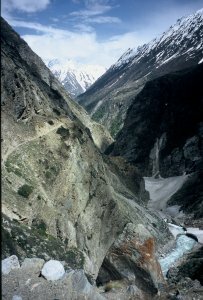 On half way, the Ganges had split into its two source rivers, Bhagirati and Alaknanda. "On the bend go slow friend", "Enemy of the road: liquor, speed and overload", "Mountains are pleasure if you drive with leisure". Another 97 km through the mess of Alaknanda foothill gorges to Chamoli. Then 50 km to Joshimath. The landscape becomes greener, and the heat finally comes to an end. Soon rain sets in. In the thunderstorm showers, the landslides become very lively, there is not only water coming from above. After 7 1/2 houts we arrive in Joshimath (1950 m). If the foothills already were a lot wilder than our hills at home, we encounter a severe landscape now. 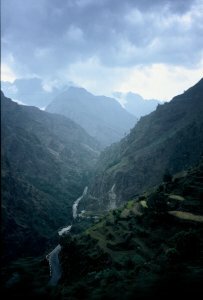 Deep below rivers are running through their gorges, and above the first higher mountains of Garhwal steeply rise up like a fortress. The rock is good and solid, many side valley seem to be unaccessible at all. Further in the background, wild, partly glacier-covered rock spires are looming. In the morning a short shopping in "town", then we are brought up by jeeps to the ski resort which is at about 2700 m. India's highest and longest cable-car is currently not operating. After we moved into the small huts, we do an acclimatization hike. Up to 3200 m trees are growing, the scenery is similar to the Alps. we follow a grassy ridge for three houts, until we can enjoy the view from the north summit of Chitarkana (3797). The weather turned cloudy and we were afraid of getting wet, but it stabilized again in the afternoon. At six in the morning we get Early Morning Tea. An hour later we go down to Joshimath by jeep, have a quick breakfast and, at half past eight, continue the trip upwards the valley of Dhauli Ganga. Steepness everywhere, there are hardly any level places. Mostly the river is running in a deep gorge below us. 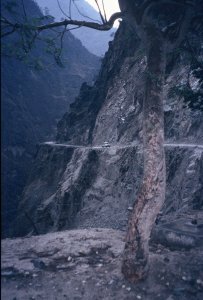 The road often is built into the rocks in a quite daring way. Any oncoming traffic causes several minutes of manoeuvering. There is a noticeable military presence around Joshimath and along the road. After 60 km we reach the village of Malari; after that we follow an unpaved road for 20 km until we meet the porters who had been recruited from the villages around by the trekking agency. Just beyond, workers are busy digging through a snow field to make the road usable. We have to continue on foot. Fortunately it is only 1 1/2 kilometers to Bampa (3350 m) where we will spend the night. The village is still abandoned, the villagers will come in about two weeks with their herds from down the valley. We install our camp around the school. The secenery resembles the Italian side of Mont Blanc, but bigger: a little bit of woods, many steep rock precipices and huge rock walls. Some of the porters and our british comrades spend the rest of the afternoon playing a very strange game which they call cricket. It takes some time until the kitchen is completely installed. 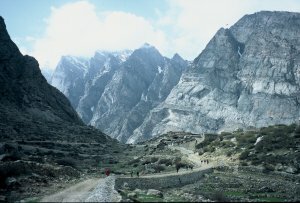 In the area only 48 porters could be hired, but we would need about 70. Tomorrow some more should come up from the valley, but currently there is wedding season, and many seem to prefer the celebrations rather than working for foreign expeditions. So some of our porters go the distance twice. Today this is not a big problem, it is not far. But the day after tomorrow the distance will be too long to do it twice, carrying a full load. Forty minutes after leaving Bampa we arrive at the Border Police control post. It takes about two hours until Naveen, Mr. Pandey and our liaison officer Rathore apparently cleared all formality, and after a detailed face-check we may continue. Behind the narrow Niti gorge the valley widens again, but the river remains cut in very deep. An hour after the police station we reach the village of Niti (3450 m) where the trail begins to rise again in order to enter the next gorge. According to the map, Niti is the last village in the valley. Except for the police post there is nobody in the village. Our British play cricket against the Border Police. Fortunately, since Frank Smythe's times at least some changes happened: The trail doesn't lead up to the pastures of Bamlas (and 300 meters down again) any more but more closely follows the river and crosses the steep walls of the gorge. After that, again a high valley opens. Vegetation is sparse, most of the valley is scree-covered. At the upper end of the valley where the Dhauli Ganga exits the Kharbasia gorge, we have to cross the river and leave the valley to the left side. Since there is neither a bridge nor a rope bridge, we have to wait until tomorrow morning when the water flow might be less. At 3890 m we pitch our tents. The rest of the afternoon is spent with more or less successful attempts to build a bridge. There are steel girders around which are obviously intended for this purpose, but the screws needed to connect them are missing. With only human power, it is not very easy to compose a bridge about five meters long and position it over the torrential river. Nevertheless around evening, a somewhat usable construction was achieved. The water level did not drop very much during the night. Thanks to the bridge, we reach the other side well nevertheless. 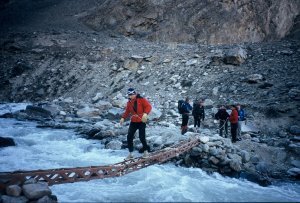 But the building will probably not survive any larger floods - so the porters shall pull the bridge onto the river bank and put it back in position in four weeks. Until then, we will be cut off from an easy way out here. 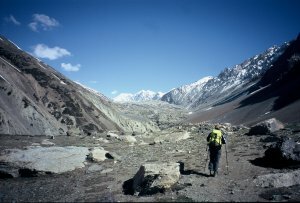 The trail crosses several scree fields and leads through the valley rather level. We pitch camp at the last alp before the final ascent - Raikana Kharak (4370 m). Still we have too many loads for the 48 porters. 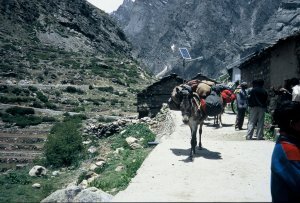 The way to base camp would be too long to go twice a day with a full load. We will make the remaining 400 height meters tomorrow. Today the weather begins like the previous days, but in the afternoon clouds come down from the peaks, and at three o'clock snowfall sets in. That causes some mess because the porters are sitting in the snow without any shelter - the big tent is one of the last loads to arrive here. 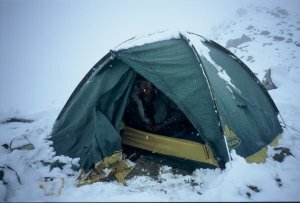 Some of our high camp tents must serve as temporary accomodation. In the course of the night the snowfall had stopped. The morning weather still looks not too convincing. 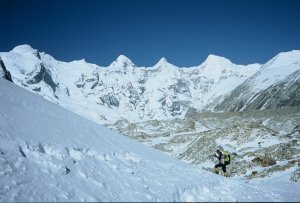 The porters' motivation has suffered from the 10 cm of fresh snow and the uncomfortable night, so most of them are not willing to carry loads to the base camp site. Out of the 48, only 12 are remaining. A first number of loads is brought to Vasudhara Tal in the morning. Also we go up, this time without our rucksacks, to have a look at our home for the next few weeks. Soon the weather is sunny, and the snow quickly melts again. After two hours we reach the spot where usually the base camp for Kamet is installed. Almost unnoticed, we have left the end moraine and stepped onto the glacier. 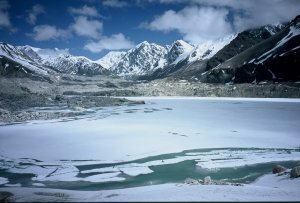 The glacier lake Vasudhara Tal is about 800 m x 300 m in size and completely covered with ice. Besides, there are many smaller lakes and ponds. We find only a couple of good tent sites in a terrain of ice and rocks. 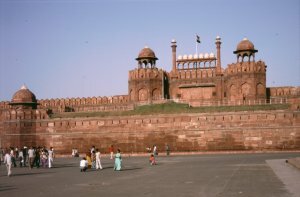 Some waste from previous Indian military expeditions* is spread over the scree. At least, the bequests of the last expedition also comprises 15 tins of pineapple and several tins of cheese which still are not at their best-before date. Around noon we are back in Raikana Kharak where it is a lot more comfortable (there is grass and juniper), but it is also a lot further away from the mountain. * For us as a foreign expedition, it is a central issue of the permit not to leave any waste in the mountains. The remaining twelve porters decided to bring to loads up today each. That eases our logistic situation at least a little. We ourselves will carry what we directly will need in base camp and abandon our camp Raikana Kharak. 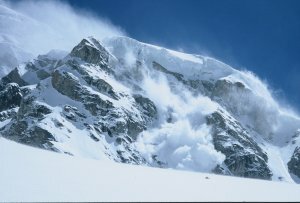 What is left down, will be brought up by the Sherpas during the following days. The weather is perfect, most members cope well with altitude. Despite more luggage, today the 320 height meters are easier than yesterday. During the rest of the day we install our base camp. That necessitates some major work until there is enough level space for the tents on the moraine. Until we will have an advanced base camp closer to the mountain, Vasudhara Tal will be our home. Without fresh snow the area looks much more friendly. The wind, however, seems to be unavoidable. Today it begins at 3 pm. In the evening clouds close in from the southeast, and there falls a little soft hail. Again a cloudless morning. Also in base camp the sun comes rather late (7 am), the mountains in the east cast long shadows. At six in the morning, the Puja ceremony takes place. Instead of tsampa like in Tibet, here a coconut plays a central role. After breakfast we begin our way to camp 1 with a first load of equipment. The glacier crossing to its southwest rim is an endless up and down. Also the rest of the way offers a lot of wasted height meters. Fortunately we can walk on good snow rather than having to proceed on moraine scree. After about 8 km (and 4 1/2 hours), we find a suitable spot at 5040 m where we pitch a tent and deposit the equipment inside. The scenery is impressive: Above the south rim of the glacier, huge vertival rock and ice walls are rising up to the summit of Bidhan Parbat, Deoban, and Mana - Mana being 2000 meters above us. The way back to base camp takes 2 3/4 hours and is quite exhausting because due to the warm weather we already used up our drink supplies. The afternoon is cloudy and windy again. Just in time as the snowfall begins, we are back in base camp. Snow falls until dark, although - as usually - not very much. After yesterday's effort, today will be a rest day. And we will need it in order to sort and distribute the food for the high camps, level the tent site for Hazel and David, and build the toilet. As mostly, the morning is cloudless; today, however, the wind begins as early as 11 am. Hazel and David, who had spent two more days in Raikana Kharak because of David's cold, move to base camp today. Second load carry to camp 1. In the morning at 7, there are almost no clouds, just some harmless (?) cirrus clouds. At nine, the sun is just a dim disk trying to be seen through the clouds. So, during this four hour ascent, there is no sweltering heat but sometimes there is an annoying wind. The afternoon is spent installing the tent and some afternoon nap. Supper in the "unfurnished" mess tent: We sit on rucksacks, jerry cans, and whatever we find. We cook on small kerosene stoves: Mashed potatoes and, as a sauce, a "veggi-burger" instant mixture with an addition of tomato sauce, onions, and cheese. Tomato sauce, onions, and cheese finally were the only detectable flavours in the final product. If we had alrady thought that the first carry to camp 1 was an unsurpassable strain, the way to camp 2 today sets us right. First, as before, we encounter moraine hills, ups and downs, endless distances without height gain. After 3 km it becomes steeper, the glacier narrows in the gorge under Mana Peak. There is no cloud, sometimes it is calm and hot, sometimes windy and cold. Changing clothes many times, and walking with the heavy load is hard in this altitude. The further we move around the bend to the right, the more parts of the route to Kamet becomes visible: Meade's Col, Abi Gamin, the problem zone between camp 3 and the upper glacier plateau, and finally also the site for camp 2, 5540 m. A moraine dam separates a small level side valley from the main glacier; there is better protection from the wind. After five hours finally we are here, deposit our loads and begin our way back which fortunately takes only 1 3/4 hours. A little below camp 2 we see a lammergeier (bearded vulture) circling above us majestatically. What feeds a three meters big bird up here where not a single plant is growing? Camp 1 is meanwhile filled with cook Saroj. He serves Daal Baht (rice with lentils); the seating situation has worsened, because meanwhile Hazel, David and Neil have come up from base camp. 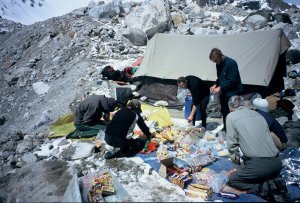 For twelve expedition members, three Sherpas and the cook, the mess tent is really a little small. The second time, with less load, we manage the way from camp 1 to camp 2 in four hours, with considerably less exhaustion. The morning is sunny again, but not as hot as yesterday. In the afternoon snowfall sets in - fortunately after we have finished pitching the tents. For today, we are planning a reconnaissance of the way to camp 3. We will bring as many fixed ropes further up. Already from a distance one can see that the way from camp 3 to camp 4 will demand a lot of work. The way to camp 3, however, is in a somewhat hidden valley - we'll have to be prepared for surprises. Unfortunately Claudia and I don't feel well today. Stomach and cough let us gain only 100 height meters, we still are somewhat affected by the first night at the new altitude of 5500 m. So we decide to make the descent to base camp one day earlier in order to have two instead of one rest days before returning to camp 2. Our rucksack is almost empty, since we can leave tent and sleeping bags in camp 2. Each of us has a second sleeping bag in base camp. There is not much to see on the long descent (14 km): Neil meets us coming up from camp 1, the kitchen moves from camp 1 to camp 2 um, and we see the the lammergeier near camp 1 this time. The weather is mixed in the upper valley, more sunny towards base camp, but still very windy. In the evening also at base camp snowfall sets in. The night brought us 15 cm of fresh snow here, and it is still snowing. How things may be up in camp ? Since the camp is behind the gorge, we have no radio contact. 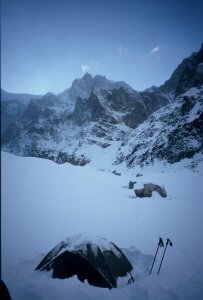 With the fresh snow and bad visibility the way to base camp is probably hard to find. We leave the tent only for the meals and for the toilet. 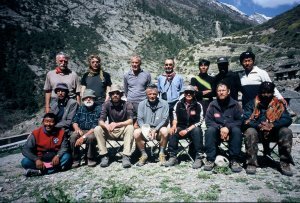 At four in the afternoon, five of the eight inhabitants of camp 2 arrive in base camp after a long time of trail breaking. The other three stay up one more night in order to better acclimatize and to take care of the tents not being destroyed by the heavy, wet snow. For only about half an hour we could imagine that there are some mountains around our glacier. All the rest of the day was whiteout with continuous light snowfall. In the tent, it is sometimes cold, sometimes hot depending on the thickness of the clouds. We can still afford a couple of bad weather days, but then we must be able to establish the higer camps. Today, at least we have put together the food supplies for the time in and above camp 2. When we will start next time for camp 2, we should stay close to the mountain until we will either have reached the summit or have run out of time. 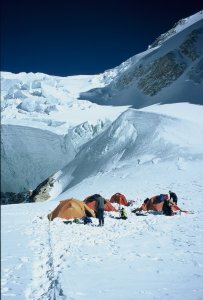 Today, nevertheless, only the remaining camp 2 inhabitants come down to base camp through a lot of deep snow. At last, sunshine again. In the south we still see thicker clouds, but until tomorrow the snow should have settled enough to make the long way to camp 2 sensible. In the morning, we have the washing day which we were hoping for a long time: Body and clothes are cleaned with about 3 liters of warm water per person. The kerosene supplies of the kitchen are limited, therefore warm water is the most valuable good. Afternoon has the usual snowfall again. Today is a very interesting day to learn about the local weather. But we don't know that beforehand. 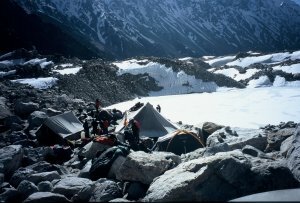 And it happens just today when we have to go the extremely long way from base camp to camp 2, because camp 1 is abandoned except for an emergency tent and we left our high camp sleeping bags and matresses up in camp 2. Fortunately we have to bring up only 12-15 kg per person. When leaving base camp at seven, it is clear and rather cold (-10°). Therefore at least the first couple of kilometers is not too warm. At ten o'clock - still calm - suddenly sweltering heat begins. We plod up the glacier to camp 1 and have an hour of rest there to refill fluid. On we go in the heat. Only before us, at Mana Peak, some cumulus clouds have formed. But suddenly at 2 pm an icy western wind sets in. Within half an hour it is completely overcast, with 70 km/h winds, snowfall and bitter cold. Until 3:30 the wind diminishes and snowfall becomes sparser. As we arrive in camp 2 after exactly ten hours, the snowfall has increased again. 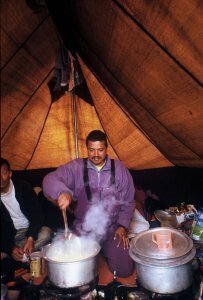 Fortunately the Sherpas are there and have already prepared hot tea in the mess tent*. So we do not need to look for water and install our stoves. A lot of weather change for a single day. *In camp 2 we have a (combined) kitchen and dining tent because this is our advanced base camp. The weather is up and down today - strange, after the night had been starry. We rest in camp 2 today. 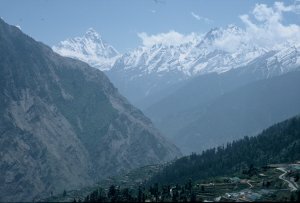 John, Neil and Rock are planning to come up from base camp; Hazel and David descend to base camp and give up Kamet; in the meantime they will undertake a trekking tour around Joshimath. 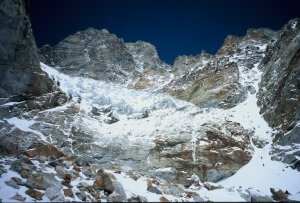 Martin ascends to camp 3 with the Sherpas Purba and Dukpa in order to fix the ropes in the difficult section above camp 3 tomorrow. Snow, snow, snow. All the night it was snowing and storming. Here in camp 2 it added up to "only" 25 cm, but further up in camp 3 the snowdrift is up to a meter high, and a certain danger of avalanche cannot be ignored. So today there will be neither work at the fixed ropes nor any load carrying. We had not expected such a persistent bad weather here. Three or four bad weather days and the usual Himalayan daily course (as we clearly had in the beginning) would have made sense - but now the weather has been bad since a week. 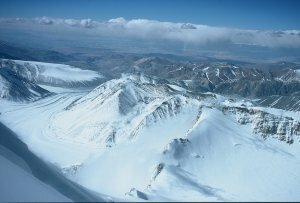 Including today we have a reserve of six days - but then the rest of the climb must go like clockwork, and we would have to come down to base camp with all the stuff from camps 5 to 2 in the evening of June 7, the evening when the porters are supposed to come up. Yesterday evening we could finally see some parts of our environment through the patchy fog. It is cold today (-18°) but the sky is clear. We leave camp 2 around 9:30. The slope leading to the small side valley is 45° steep but in the good snow no problem. The flatter part of the valley is very tiring in the heat of the day; in the valley end a fixed ropes needs a short effort. Having reached the glacier terrace, the trail enters the hidden, almost endless high valley which one could only suspect from below seeing all the vertical rock walls. Today our helmets are a good choice, since from the walls close by one or another stone might come down. 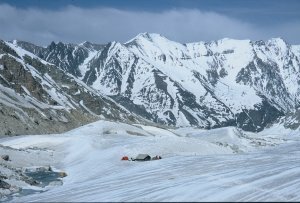 Camp 3 is situated at 6140 m in the middle of the high valley below the rocky castles of the secondary summits of Abi Gamin. The rock barrier of Abi Gamin also blocks the further way to the glacier plateau of Meade's Col.
Martin and the two Sherpas installed the fixed ropes up to the end of the rock barrier today. If the weather remains good, the way to summit should be "free" now. As free as the way to a high 7000 m summit just can be. The others descend to camp 2 again in order to re-ascend tomorrow or the day after tomorrow with another load - too much energy? Rest day. Probably necessary, yesterday it took me 6 1/2 hours to gain the 600 height meters. Especially my cough was very annoying, and my digestion is somewhat wrong, too. In the course of the day, our Sherpa Urgen will come up from camp 2 with his equipment, our sope and the remaining gas cartridges. As he already had carried some stuff up yesterday - including the tent in which we are staying here - everything is prepared to continue to camp 4 tomorrow. The morning is cloudless, then soon cirrus and cumulus clouds are coming. The weather doesn't seen to approve our plans. Very obvious bad weather in the morning: zero visibility, snowfall. 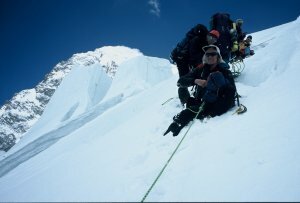 It is becoming more and more questionnable if at least part of the group will be able to reach the summit. 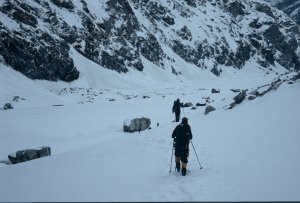 Mathematically, we can afford four more bad weather days; but if the weather will keep the four day rhythm (2 good, 2 bad), then we would have to stay two bad weather days up in camp 5 at 7000 m. Those who would have enough energy for the summit after that would probably be able to do it without camp 5, too. We also do not have enough supplies to stay in camp 3 forever. That is the disadvantage to have done only one carry from camp 2 to 3, so there migth be some diet days soon. The third successive night for me to feel rather worse than better up here in camp 3. Strange breathing problems, so this will hopefully not evolve to a pulmonary edema? It was obvious that my acclimatization did not work as good as I had expected, all ascents appeared to me somewhat strenuous and mostly I arrived a lot later than Claudia did. Further up it will be need an even bigger effort. The summit is not worth the risk to get into serious problems (especially here far away from any possible rescue), and the whole thing should be fun rather than toil*. 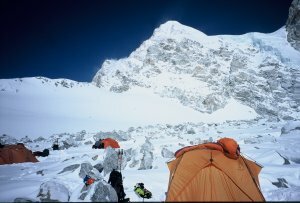 I therefore decide to return to camp 2 and recover there, while the others try to reach the summit in the remaining seven days (until they'll have to return to C2). The weather today is great, but yesterday there was so much fresh snow and storm that one has to wait until the snow is settled before continuing to camp 4. The descent from C3 to C2 is interesting, too: No trace from the day before yesterday can be seen anymore, I work downwards through deep snow. From the valley, bad weather is coming up and makes the small scree-covered valley an interesting orientation game. Especially since one should find the exit, the 45° snow slope. In camp 2 our cook Saroj is already waiting for me, left alone by his two guests Neil and Rock this morning (they left this morning towards camp 3). Beautiful weather, but cold. As soon as the sun will come here in camp 2, I will move the tent. Meanwhile the ground had thawn to a slope, I always slide down from the mattress. Unfortunately we have no shovel here, but at least we have a cooking pot. In the afternoon snow is falling, but at sunset the clouds break up again. The summit team starts at 10 a.m. in camp 3, they reach camp 4 at 6600 m 4 1/2 hours later. The fixed ropes give a clever and interesting route through the wall that had looked so unapproachable. The technical difficulties should now be overcome. With all the equipment and food and gas for the summit bid, the loads are very have for everybody, and the fixed rope gymnastics is strenuous. During photographing at the ropes, Claudia's down jacket meets a sharp rock. Everything is covered by white feathers. Cloudless again. If this is finally the stable weather which we need so urgently? It would come not a single day too early. In camp 2 we see some traces in the snow. Saroj says it was a snow fox. So there is somebody else besides us here at 5500 m. Rock and Govind unpitch camp 3 and come down to camp 2. We hope he will bring some gas cartridges, because soon camp 2 will be running out of kerosene. In the afternoon also James shows up in camp 2, he descended from camp 4 and is quite exhausted. In the cold of the morning, first the tent must be unpitched where Claudia, James and Mike spent the night. For James the night was quite uncomfortable because he had left his mattress below the fixed ropes for saving weight. Mike, however, spends a good and warm night; since a couple of days he using one of our base camp sleeping bags instead of his own one. The impression of easy terrain is wrong, and it was not a good idea to deposit the jumars in camp 4. 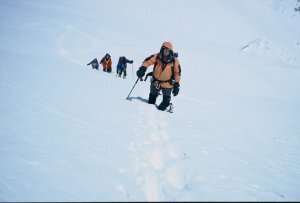 So a 70 m high snow/ice step costs a lot of time and effort. After that it is really easy, but the powdery snow becomes deeper and deeper, and trailbraking is a lot of work. Seven hours to camp 5 at 7080 m, directly below Meade's Col.
Nice weather, some wispy clouds at Deoban; in the course of the day cumulus clouds are forming. At ten, the summit team has reached an altitude of 7350 m as we hear by radio. At twelve they are still about 300 height meters from the summit, so they advanced only a hundred height meters in two hours. In the night a strong wind had shaken the tent, but in the morning it died down. It is cloudless and about -20°C. Already at 5:30 the sun is coming, and preparations for the summit bid are beginning, especially water melting. Martin and the Sherpas are discussing about the route choice. We leave camp 5 around seven, using the normal route towards the summit. 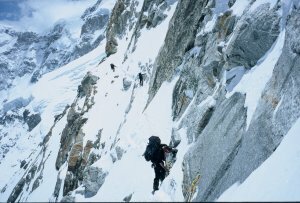 The Sherpas favour the ridge route, but we stay in the slopes at the left of the ridge because the terrain is easier. But there the progess is slowing down more and more, the snow of the preceding bad weather days has accumulated in the lee of the ridge. Where the slope finally steepens towards the summit, the snow is more than waist-deep, and trailbreaking becomes an exhausting burrowing work. Progess becomes slower and slower, and the biting wind is cold despite the sun. Escpecially the feet, in the deep snow, are suffering. 80 meters below the summit finally there is no progress any more: Everybody is exhausted, the slope is steep (50°), and in this treadmill it would take us at least two hours of hard work to - maybe - reach the summit. Back to the camp. At 6 p.m. everybody is back. Possibly the ridge would have allowed a better progress; but normally the ridge is exposed to the wind and therefore icy, necessitating time-consuming belay. What a birthday! (Today is my 40th.) At eight in the morning we get a radio message saying that at least two or three persons in camp 5 have frostbite and hands and/or feet. And they need some load carrying help, the fixed ropes must be taken down again. At half past four, finally the tiring ascent is done: we meet the others near camp 3, take some load to be carried down and finally we all reach camp 2 at half past six. A first stocktaking shows that besides some slighter cases of frostbite at the fingers, especially Steve and Tom are affected more seriously. But in the cold of the camp hardly any more can be done than wrapping the fingers with sterile dressing material. On Saturday morning it is completely clear that no second attempt nor any alternative summit is possible. At least three members suffered frostbite at hands and feet (which were not yet visible yesterday evening), one presumably has a pulmonary edema. The most important thing therefore is to get sown as soon as possible. Having packed up the camp, a long descent begins taking a lot of time, as exhausted as everybody is. After 4 1/2 hours camp 3 is reached; from here on the route is (almost) only easy terrain. After yesterday's effort, neither water nor food are willing to stay in the stomach, so Claudia is happy to hand over her heavy rucksack at camp 3. After the long descent of 1500 height meters yesterday, today is scheduled as a rest day before we can do the long walk out to base camp. Only th Sherpas bring down a first carry down and will come back tomorrow for a second carry. So we can ensure that tomorrow camp 2 will be completely closed down and everything will arrive well in base camp. On closer inspection, Steve's and Tom's frostbitten toes don't make a good impression. 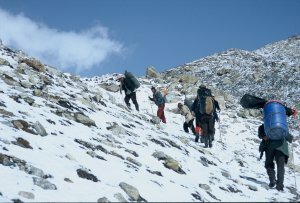 As long as there are no complications and the two can walk without problems, they should get down to basecamp as soon as possible. Therefore, a group of five (Steve, Tom, and accompanying them Mike, Claudia and I) begins the long way down the valley. Again it is very hot, the snow is deep and the trace is bad. We don't make much progress in the beginning and already are in doubt to reach base camp today. Just in case, we have tents and sleeping bags for a possible overnight stay with us. Fortunately after two hours it becomes a little colder and the snow becomes better. Around seven, we are in the base camp. The frostbitten feet survived the 14 km forced march without worsening. The whole night was cloudy with a little snowfall, but no snow was left. Above zero degrees already in the morning. The moraine landscape has changed a lot during the last two weeks: Sand and stones are predominant, only the biggest snowfields are left. Our tent site obviously has moved a little towards the lake: Our tent has a tear which can only have come from some movement. A tent standing on sand rather than snow (as in camp 2) gives a completely different feeling of kind of a luxury. The others - Martin, John, James, Neil and Rock - left camp 2 this morning at six, and they arrive in the course of the day. Naveen tells us that during the last 35 years there never had been such strong snowfall in this season. Of course this happens just when we are here. Bad weather, snowfall. If the weather would have been nice one might have had a look at the surroundings of the basecamp and find some spot with a good view to Kamet from a little higher up. But now this won't be the case. Anyway we have to pack our things today, in the evening the porters should arrive. If they can cross the Dhauli Ganga - the is still the uncertainty about our bridge. At least on the day of goodbye to base camp we have good weather. Twelve porters had arrived yesterday eveing, this morning they were joined by several mules. After three hours of descent through stones and scree with something resembling a trail we reach our bridge which, astonishingly, is standing exactly like we left it four weeks ago. So we quickly reach the other side and finally a reasonable trail. In the high valley we meet a French-Israelian group on the way to base camp, planning to climb Kamet. The purchase the remaining gas cartridges from Martin, since they apparently don't have any. * For a mountain like Kamet, however, the group also seems to be a little scant of high altitude porters and fixed ropes. Even one participant tries to complete her equipment with reasonable boots - she wants to buy Claudia's boots, but that comes to her mind long after we had met (so Claudia gets the information only in Niti), so the deal does not come about. The Niti gorge, being more than six kilometers long, is endless, and the many ups and downs are very annoying. Seven hours after leaving we reach Niti which now is inhabited. People cultivate the fields and have goats and sheeps on the pastures, and there is Cricket on the main place of the village. Everything has become much greener. After the mulis arrived two hours later and the kitchen is installed, there s Daal Baht. We hope it is the last time, tomorrow we want to be in Joshimath. From somewhere a bottle of "local wine" has appeared. But it is more high-proof than a wine, the ingredients elude a more exact definition. Especially after the second glass. *In Delhi indeed there are no butane/propane gas cartridges available. We walk down an hour from Niti to Gamsali where we are welcomed by the Border Police. Tea is offered, and we have a first opportunity to make a phone call home. We try to get the vehicles a day earlier (they were scheduled for tomorrow) and walk on to Bampa in order to wait there. Also Bampa is full of life now, especially because currently there is a religious celebration there. We even find a shop where at least cookies, potato chips, nuts and tomatoes are available. The village shows a certain wealth - who else at the back of beyong has a solar-powered steet lighting? We wait several hours, and the kitchen - once again - offers Daal Baht. After four hours we can stop an empty bus driving downwards. For 1000 rupees he is willing to take us to Joshimath. The driver seems to be very interested to finish work as soon as possible, as we cna conclude from his way of driving. It is some relief that the brakes seem to work well and that he apparently has everything under control. The road often is not wider than the bus. It is not really important if the precipices down to the river are 50 or 300 meters high when thinking about a major driving mistake. 3 1/2 hours for about 60 km distance to Joshimath. Rest day in Joshimath. We had the option to go to Badrinath, one of the most important pilgrim places of the Hindus because there is one of the two "official" Ganges sources (of Alaknanda, the other source is Kedarnath, the source of Bhagirati). Since we would have spent three hours in the bus for one way of 62 km and the same for the way back, we prefer to have a restful day in Joshimath. The bus drive yesterday was enough. The weather is also not extremely good, so an excursion would not really be worthwile. Surprise at dinner: Our friends present a late birthday cake for me. It is colorfully decorated, very sweet and apart from that rather indefinable. Probably the way the local pastry cook understands a cake. From Tom and Steve I receive a huge cricket ball filled with brandy ("Sikkim Fireball") as a thanks for toe and finger care. 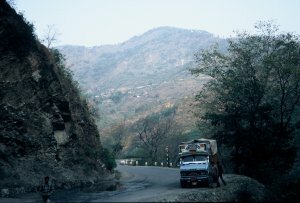 The bus drive back from Joshimath to Haridwar - 280 km - takes 13 hours on the winding mountain road. What we did not notice on the way there: The road becomes the better, the further down we get, and the foothills are much less jagged than the wild scenery between Bampa and Joshimath. 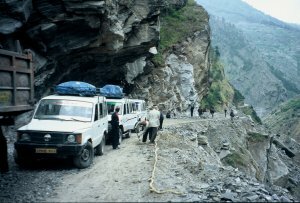 But our progress is made difficult by the strong oncoming traffic: Hundreds of pilgrim cars and buses are on the way to Badrinath and Kedarnath. The "real" pilgrims however do all the way on foot, and there are even some who measure the distance with the length of their body. In Haridwar (one of the seven holy towns of the Hindus), there is a big traffic jam due to the pilgrims which takes us more than half an hour. 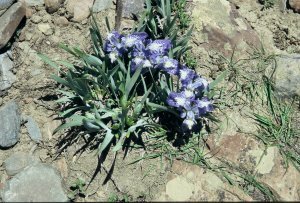 Atfer arrival in the hotel, we first examine and dress fingers and toes for half an hour, because meanwhile four members have developed more or less strong blisters and black tips which must be kept clean very carefully in the heat of the lowlands. In the Alaknanda Hotel we find a restaurant which - of course vegetairan - serves the standard choice of dishes in a record-breaking slowness (2 hours) and quantity (10 french fries per person). At nine in the evening we still have a temperature of 34°C. The morning is a little cooler than the evening, but still rather hot. The hotel is nicely situated directly at the river; Ganges gives a little coolness, but it flows very rapidly and is not suited for swimming. Anyway we have to leave early, at six. Breakfast at half the distance in a big Indian fast-food place - finally no Daal but cheese sandwich and ice; the 200 kilometers to Delhi take six hours on the road, because always slow vehicles force a braking: rickshaws, bicycles, bullock carts. Generally speaking, traffic in India is very different from Eurpoe: Everybody looks exclusively for his progress, and consideration for the other road users is given only to avoid direct collisions. Fortunately this mostly somehow works, nevertheless Indian roads are comparably dangerous. In Delhi we got a few little things to do, but for any bigger activities 38°C are clearly too warm. We enter the airport in the evening two hours before flight departure, but this normally plenty of time is quickly eaten up by an excess baggage discussion with Air France, half an hour of waiting time for the passport control (for a queue of 15 people! ), taking of the mountaineering boots at the safety check and abstruse security objections against our batteries in the hand baggage (as a result the hand baggage is taken away by the personnel). So we are the last ones to enter the plane. On Monday morning we reach Frankfurt basically on time; the hand baggage arrives on Tuesday while we are already spending the first day in office.